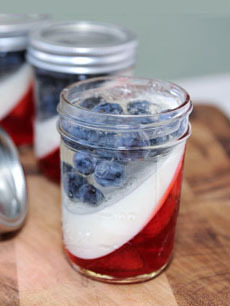 Top: Red, white and blue Jell-O mold in Mason jars (photo Victoria Belanger | eHow). Bottom: No spoon is needed with these Jell-O fingers. They’re gummy, like Jell-O shots without alcohol. Here’s the recipe from CommunityTable.Parade.com. Call them Ball Jars, Kerr Jars or Mason Jars, these 19th century inventions enabled the preserving foods for years, while avoiding spoilage and the growth of harmful bacteria. The original “canning” took place in hermetically sealed glass jars, invented to carry food for Napoleon’s army. Here’s the history of canning and the jars. The growth of the artisan foods movement, small producers added charm to their jams and dilly beans by packaging them in Mason jars. Today, we’re presenting an idea adapted from Victoria Belanger. You can see step-by-step photos on eHow.com. 1. MAKE the red layer. Combine the water and the Jell-O in a bowl, stirring to fully dissolve. Add the cold water and the strawberries. Stir and divide the mixture among the Mason jars. We used a wide-mouth funnel (so the strawberries would fit through) to keep the sides of the jars clean for the other colored layers. Victoria used a different technique. 3. MAKE the white layer. In a medium bowl, evenly sprinkle a packet of unflavored gelatin over the cold water. 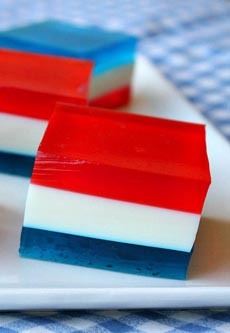 Allow the gelatin to set for 2 minutes, then add the boiling water and stir until the gelatin is completely dissolved. Add the sugar, stirring to dissolve, and then the melted ice cream. Spoon into the jars, taking careful to keep the inside walls clean for the blueberry layer. Refrigerate until firm, 20 to 30 minutes. When firm, you can remove the jars from the tin and keep them upright in the fridge. 4. MAKE the blue layer. In a medium bowl, evenly sprinkle 1 packet of unflavored gelatin over the cold water. Allow the gelatin to set for 2 minutes, then add the boiling water and stir until the gelatin is completely dissolved. Stir in the sugar, then the blueberries. Do not add to the jars yet, but first refrigerate the blue mixture until it thickens to the consistency of a gel (otherwise, the blueberries will float to the top of the jar). 5. SPOON the blueberry mixture into the jars and refrigerate until firm. When ready to serve, garnish with whipped cream. MORE USES FOR MASON JARS.